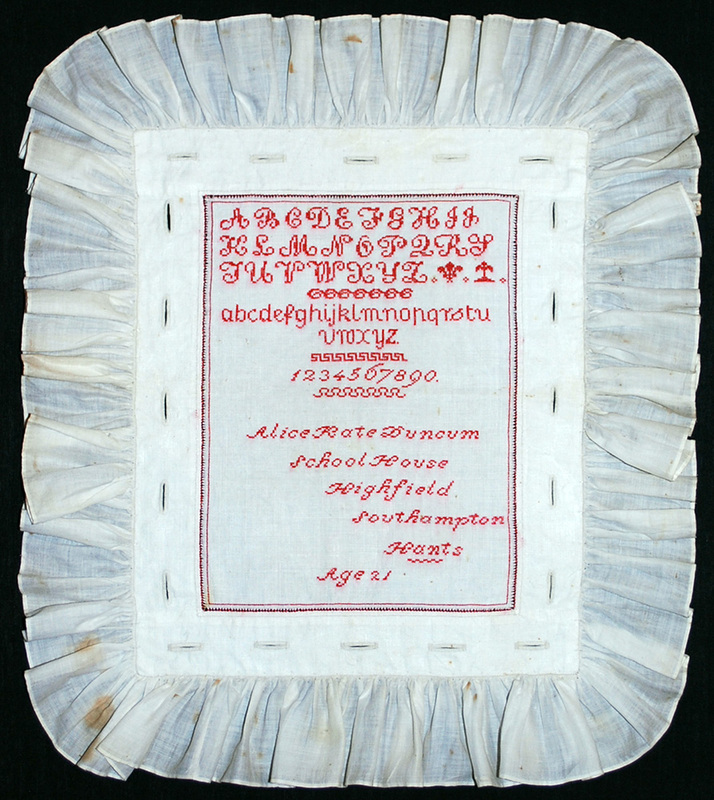 This school room exercise combining button hole, hem stitching and lettering was most likely the work of a student teacher named as Alice Kate Duncum aged 21 employed at the School House, Highfield, Southampton. It may have been entered for one of the competition run by female journals of the time. Harriet Davis Gillett. 1836. Aged 11. 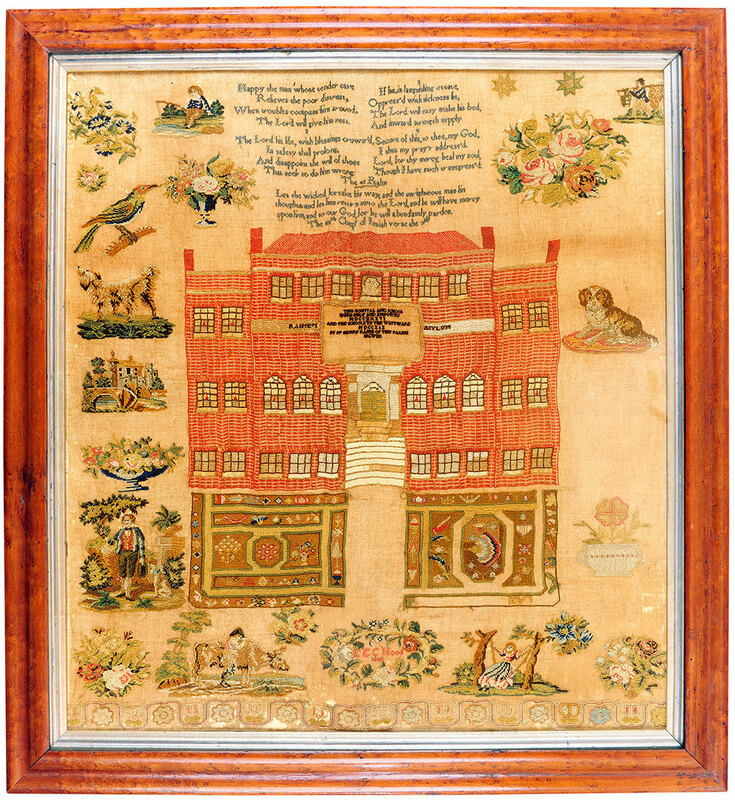 An interesting sampler showing the National School that Harriet Gillett would have attended. The two doorways marked B and G. denoting the separate entrances for Boys and Girls. Worked with coloured silks using cross and eyelet stitch. Contained in a broad mahogany frame. This large format sampler is worked with coloured silks on loosely woven linen. The small floral sprigs scattered over the surface are typical Quaker motifs. Hannah was the daughter of Robert and Mary Albertson and one of ten children. Her father Robert Albertson was born in Hope, New Jersey USA and died in Trafalgar, Ontario, Canada. To Mrs Jenkinson. Exeter 1835. 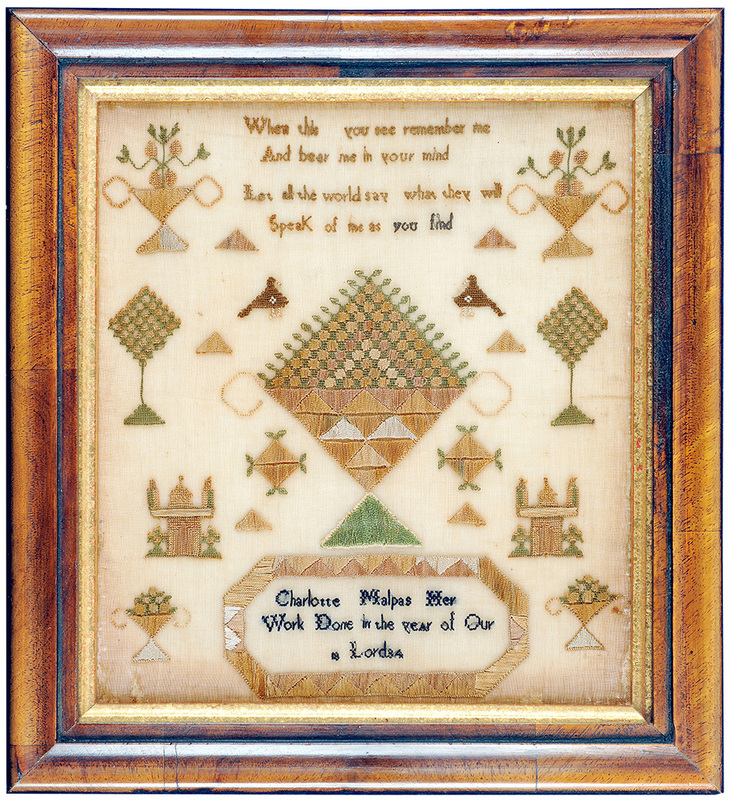 A very interesting sampler worked as a presentation piece to a Mrs Jenkinson, described 'Tis thus of Jenkinson we speak, our benefactress and our friend. Her love we still retain'. 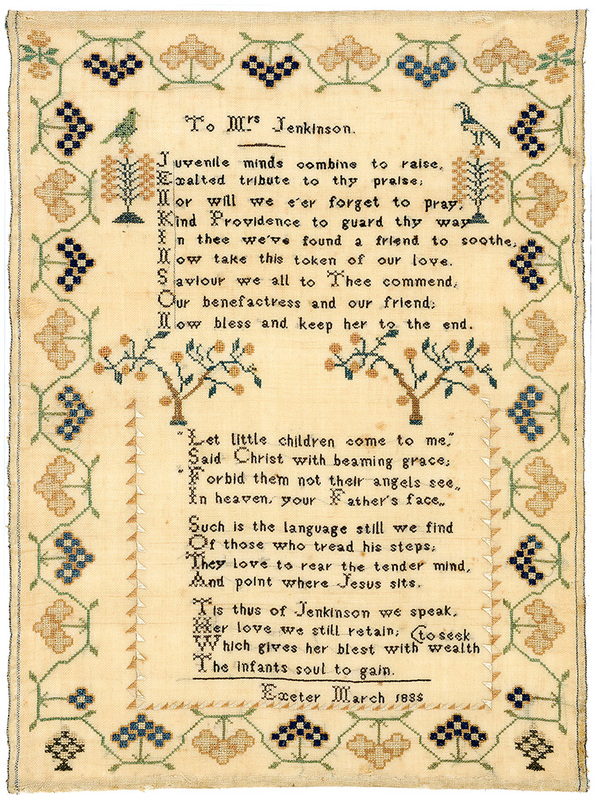 The sampler is of unusual acrostic form with the first letter of each line on the top verse spelling out the name JENKINSON. Very neatly worked on a fine linen ground. Framed Size: 20 x 15 ins. 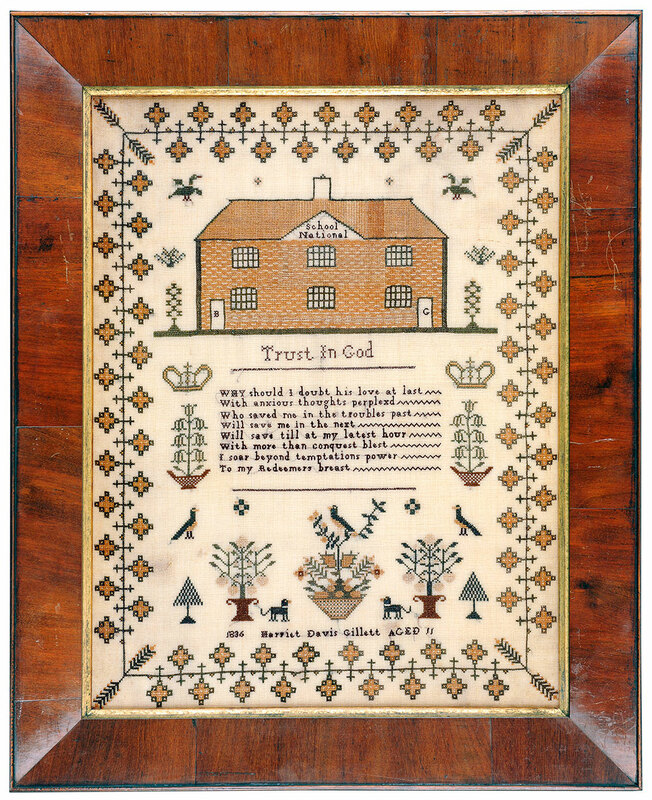 This delicately worked sampler displays characteristics found on samplers worked in orphanages.There is a very similar sampler by Emma Ware in the collection held by the City of Bristol Museum and Art Gallery. N4897. The the reverse of Charlotte's sampler states: d-and-buried 24.12.1904 No 293 Union Workhouse Infirmary. Cheltenham. Framed Size 12 x 11 ins. 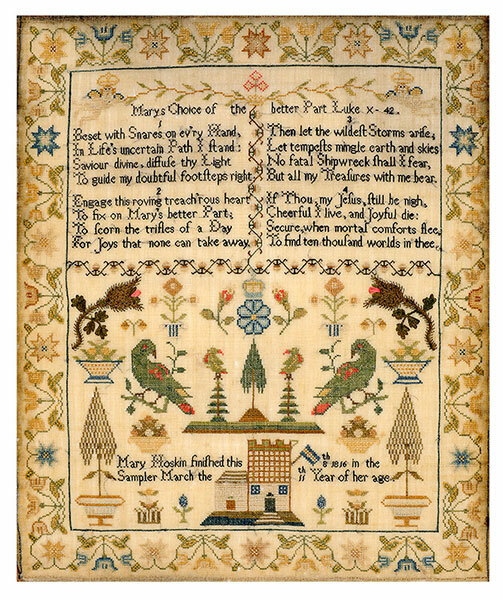 'Mary Hoskin finished this Sampler March the 8th 1816 in the eighth Year of her age'. A charming sampler worked in coloured silks. Mary's age bears tribute to both her own skills and the skill of her teacher in producing work of such a technically high standard. A brightly coloured sampler in remarkable unfaded state. 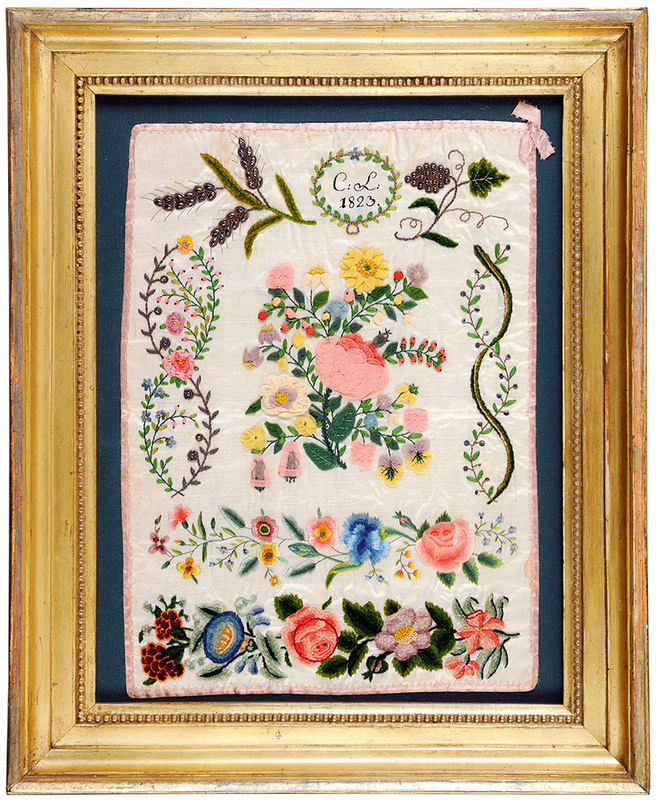 The sampler may have been the work of a student in preparation for a position as a milliner or dress maker. The striking designs are constucted in skillfully shaded silks, spangles, metallic threads, chenille and aerophane (a fine silk gauze with a wrinkled crepe appearance, popular in the first half 19th century). Worked on a silk ground and bound with pink silk ribbon. Contained in a period gilt frame. Framed Size 19 x 15 ins. Raine's Asylum originated as a charity boarding school for forty girls in 1736. This rare example is finely worked and importantly bears a large image of the original building. 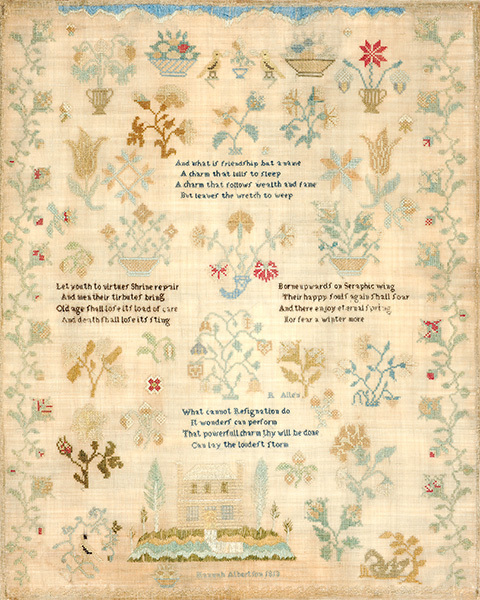 Accompanying this sampler is another one by the same girl worked two years earlier in 1846. Maple Frame. 23 x 21ins.